Mark Cassetty’s newly released “The New Genesis: Take Another Look Ministries” is an inspiring rediscovery of the greatest love story in history. 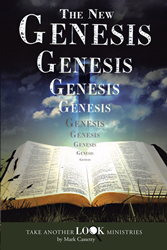 “The New Genesis: Take Another Look Ministries” from Christian Faith Publishing author Mark Cassetty is a moving in-depth look at scripture, particularly the book of Genesis, at the beginning of the greatest love story between God and mankind. “The New Genesis: Take Another Look Ministries”: a stirring reminder of God’s love, is the creation of published author Mark Cassetty, a man finding the answers of a lifetime at age seventy-three. Cassetty writes, “God the Father created three expanse rings. God the Father created three heavens—spirit, space, and sky. God the Father’s greatest example in the Bible of when he will say ‘enough is enough’ for the second and last time is found in Genesis 6:5–7. Published by Christian Faith Publishing, Mark Cassetty’s new book is a striking re-exploration of the true message of the Bible, which is simply that God loves deeply. Every Christian who wants to understand the heart of Holy Scripture will find much value and refreshment in Cassetty’s insights. View a synopsis of “The New Genesis: Take Another Look Ministries” on YouTube. Consumers can purchase“The New Genesis: Take Another Look Ministries” at traditional brick & mortar bookstores, or online at Amazon.com, Apple iTunes store, or Barnes and Noble. For additional information or inquiries about “The New Genesis: Take Another Look Ministries”, contact the Christian Faith Publishing media department at 866-554-0919.